This solution use the RuntimeMXBean. The name of the bean contains the pid (ex. 12345@localhost). Warning : The returned name string can be any arbitrary string and a Java virtual machine implementation can choose to embed platform-specific useful information in the returned name string. 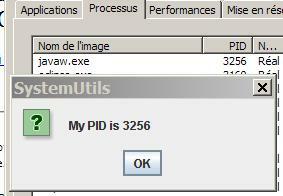 On the Sun JVM (Windows plateform), the PID is present. For a Java-JNI solution, see this HowTo.